Malta Maritime Directory :: SAILING: Oman - Mussanah Race Week 2016 - Young Sailors Make Malta Proud! Comment about: SAILING: Oman - Mussanah Race Week 2016 - Young Sailors Make Malta Proud! SAILING: Oman - Mussanah Race Week 2016 - Young Sailors Make Malta Proud! It has been only a few weeks back in December that 10-year-old Richard Schultheis, a member of the Malta Young Sailors Club, won the 16th edition of the MAPFRE/Middlesea EuroMed Regatta 2015 bringing back the overall award to Malta after 4 editions and became the youngest of all sixteen EuroMed (2000-2015) winners. 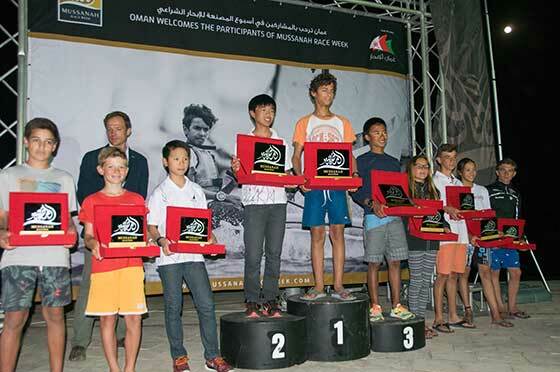 This month four Maltese youngsters, under the technical guidance of Jean Paul Fleri Soler, the Malta Young Sailors Club Youth Development Officer, traveled to the Mussanah Sports City in Oman to participate in the Optimist Class of the 6th Edition of the Mussanah Race Week 2016. The Maltese team was made up of EuroMed 2015 overall winner Richard Schultheis, Craig Farrugia Vella, and Victoria and Antonia Schultheis. Richard and Craig were the winners of their respective Classes in the last EuroMed - the Cadets and Seniors Class respectively. Victoria Schultheis, besides registering the best girls’ result in EuroMed 2015, had an excellent international representation with a 3rd overall placing in the girls silver fleet at the Optimist European Championship 2014. The Optimist Class at the Mussanah Race Week 2016 was contested by 105 sailors, including the defending champion, Daniel Ian Toh from Singapore, the Optimist World Champion (Girls) Jodie Lai from Singapore too, Mia Nicolosi (US Virgin Islands) the number one girl in North America, as well as 9 out of the current worlds top 15 Optimist sailors. Such presence of class competitors is a result of the Organisers’ bold initiative to invite the best three sailors of all IODA (International Optimist Dinghy Association) events such as Worlds, Europeans, Asians. The Optimist is an 8-foot long single-sail dinghy. This boat is sailed in over 120 countries and is one of only two yachts approved by the International Sailing Federation for sailors under the age of 16. In the 2012 Summer Olympics in London, 80 percent of all skippers were former dinghy sailors and most started in the Optimist. This year’s Mussanah Race Week saw the introduction of two new categories - the Laser Radial and Laser 4.7 which attracted 18 and 26 competitors respectively. No Maltese contested in the Laser Classes. And certainly the Malta Young Sailors Club youngsters, all under-16 years of age, gave an inspiring display bestowing on all concerned a great sense of satisfaction and pride. Indeed with 105 sailors in this category our youngsters placed most distinctively - Richard Schultheis - 5th place overall and won the 'under 12 years' category, Craig Farrugia Vella - 8th, Victoria Schultheis - 18th, and Antonia Schultheis - 36th. All four Maltese sailors ended up in gold fleet. “Yes, keeping our sailors involved in high level competitive events is the way forward. This we have seen over the past year where the Maltese sailors who are competing in overseas competitions are the ones who are benefiting and improving the most”, observed Jean Paul Fleri Soler, the Malta Young Sailors Club Youth Development Officer, on his return from Oman. In line with such perception the Malta Young Sailors Club are trying to get their top 10 sailors to compete in foremost overseas events as a build up to the two major competitions the Club aims for in 2016 - the Worlds in Portugal for June and the Europeans in Italy for July. the Europeans will be held in July. Laser 4.7: 1st Zakariya Suleiman Al Wahabi (Oma), 2nd Joakim Svinhufvd (Fin), 3rd Jaakko Vauhkonen (Fin). Laser Radial: 1st Hussain Said Al Jabri (Oma), 2nd Ronja Gronblom (Fin), 3rd Ahmed Gharib Al Hasani (Oma). The Mussanah Race Week is organised by Oman Sail, a national initiative and a non-profit organisation, established in 2008 having as its main scopes to use the power of sport to contribute to the development of the Omani people and to expose Oman’s potential as a training and competitive water sport hub.